The Spokane Chiefs put together a strong 60 minute game to control the majority of their game against Everett Wednesday night defeating the Silvertips, 5-1. 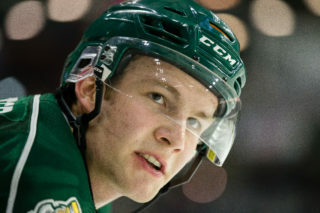 Dale Hunt scored the lone goal for the Silvertips in the first period pushing his point total to nine on the season. Spokane had five different goal scorers Wednesday night, (Brady Calla, Drayson Bowman, Mitch Wahl, Stefan Ulmer and Tyler Johnson), to move their record to 4-1 against Everett this season. This brings the ‘Tips record to 21-19-5-0 with 47 points in 45 games played standing nine points behind second place Spokane Chiefs in the U.S. Division. The Silvertips are now 4-5-0-1 in their last 10 games. 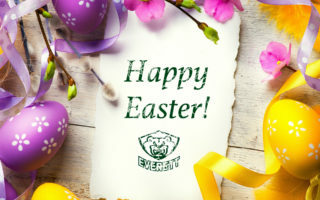 Everett has a busy weekend ahead of them heading to Tri-City for a Friday night game at 7:35, up north on Saturday night for a 7:05 start against Western Conference leading Vancouver Giants, and finally wrapping up their weekend heading back to Tri-City on Sunday night. Spokane took charge of the game quick on their first power play after a Cameron Abney charging penalty. Brady Calla would score his seventh goal of the season after an attempted cleared puck deflected off a Spokane defenseman and all the way back down to the slot where Calla would flutter the puck past Heemskerk at 4:43. Everett would pick up their play in the second half of the period after Dale Hunt tied the game 1-1. The Silvertips converted on their second power play of the game after a hard Hunt slap shot would deflect off James Reid’s glove and past the rookie netminder at 15:55. The Chiefs would go on to outshoot the Silvertips 15-12 after the first 20 minutes of play. The Chiefs would take advantage of an Everett team that was slow to get out of the gate in the start of the second, when Drayson Bowman scored his 18th of the year after a pass from behind the net from Ondrej Roman on top of the crease. The goal would come at 53 seconds and give Spokane a 2-1 lead. Mitch Wahl would add his 19th goal of the season on a great give-and-go play with Levko Koper at 12:36 bringing their lead to 3-1. Spokane would control the majority of the third period and add to their lead at 8:54 when a Stefan Ulmer slap shot from the point would beat Heemskerk on an apparent deflection in front making the score 4-1. On an Everett power play late in the period Heemskerk would be pulled for a 6 on 4 advantage but Tyler Johnson would find an empty net at 15:36 to make the score 5-1 Spokane. Everett couldn’t find any offense the rest of the game sealing the victory for Spokane. The Silvertips come back to Comcast Arena this Wednesday, January 28th to take on U.S. Division rival Spokane Chiefs! 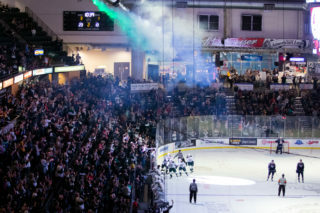 Tickets are on sale now at the new everettsilvertips.com and at the Comcast Arena Box Office! 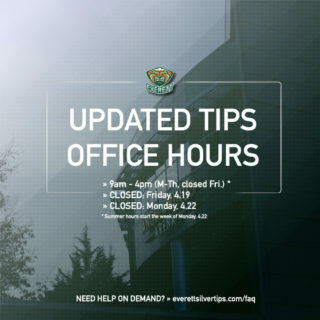 For ticket information, including season seats and ticket packages, please call the Silvertips’ front office at (425) 252-5100. 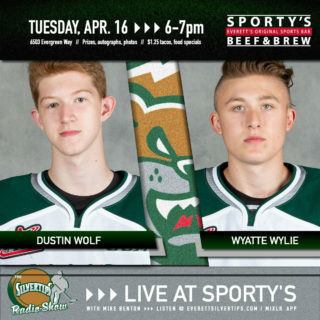 As always, radio coverage of Silvertips hockey will be provided by North Sound 1380 KRKO, while highlights of audio broadcast, video packages and relevant multimedia will be provided by the Western Hockey League’s website, www.whl.ca. 1) SPO – Brady Calla (7) (PPG) (Ondrej Roman (5), Stefan Ulmer (20)), 4:43 1st. 2) EVT – Dale Hunt (5) (PPG) (Taylor Ellington (17), Zack Dailey (22)), 15:55 1st. 3) SPO- Drayson Bowman (18) (Ondrej Roman (6), Brady Calla (10)), 0:53 2nd. 4) SPO – Mitch Wahl (19) (Levko Koper (20)), 12:36 2nd. 5) SPO – Stefan Ulmer (7) (Levko Koper (21), Tyler Johnson (20)), 8:54 3rd. 6) SPO – Tyler Johnson (13) (EN) (Trevor Glass (13)), 15:36 3rd.